The table setting is the first impression your guests have of the fine meal you are about to serve, and you want that impression to be positive and special. Proper placement of silverware and dishes is simple if you take a few moments to learn. There are lots of variations for specific course and situations, but this is the traditional way to set the table for a standard fine dining meal. This table setting has the guests' convenience in mind, giving them easy access to each utensil they will need during the meal as they work from the outside in. Begin by making sure the table is covered as you would like. If you're using a tablecloth, ensure it's wrinkle-free. Any seams or creases should be straight on the table. If you're using a place mat, it should be on the table before you begin setting it. Place the dinner plate in the center of the setting, immediately in front of the chair where the guest will sit. Do not place it too close to the edge of the table. About two inches from the edge is ideal. Set the salad plate in the center of the dinner plate. If your china has a pattern, make sure both plates are oriented to display it properly. To the left of the plate, place the dinner fork so that it is centered height-wise with the china. It should be about an inch from the plate. 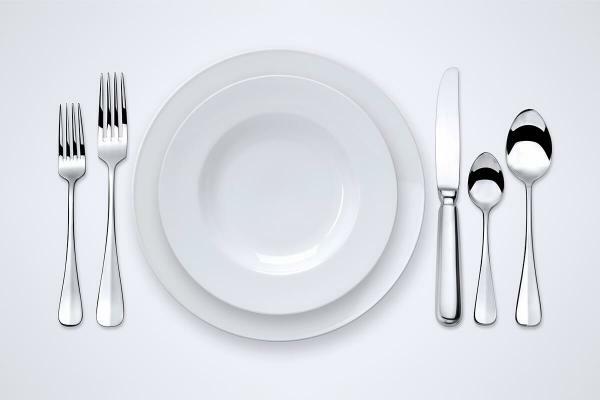 Place the salad fork next to the dinner fork, about one inch apart and centered. To the right of the plate, align the dinner knife so that it is centered and one inch from the china. The cutting edge of the blade of the dinner knife must face in toward the plate. Set the teaspoon about one inch to the right of the knife, centering it. Set the soup spoon or table spoon to the right of the teaspoon, centering it and leaving one inch between utensils. If you aren't serving soup, don't place a soup spoon on the table. If you're having bread or rolls, you can add a bread plate and butter knife to the setting. Place the bread plate immediately above the forks to the upper left of the plate. Set the butter knife on the bread plate, angling it so your guest can conveniently grasp it with his or her right hand. The plates don't have to be in the center of the setting, particularly if you'll be plating the meal before bringing it to guests. In that case, you might have the salad plate to the left of the forks. If you are having hors d'oeuvres that require a specific utensil, such as a cocktail fork, this can be placed on the right side of the soup spoon. This will be the first piece of flatware your guests will need, so it should be easy to access. Similarly, a fish fork should go on the table if you're having a fish course. Place it to the right of the dinner fork. If you're having a dessert that will require a fork, add this first to the left of the plate (before you add the dinner fork). It will be the last utensil accessed, so it should be nearest the center. Fold the napkin and place it on the plates. Place the napkin in a ring and put it on the plates or to the left of the forks. Fold the napkin and place it under the forks. Water glasses and wine glasses should go to the right, above the knife and spoons. 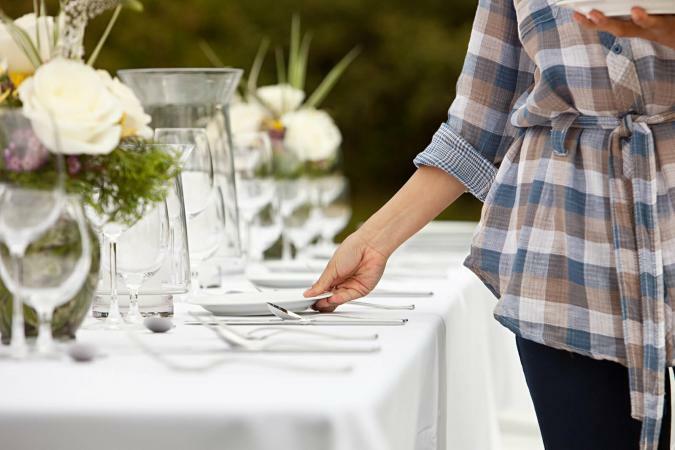 Set them in the order the guest will use them with the water glass centered over the knife. A coffee cup or teacup can go on its saucer to the far outside edge of the glassware. The key to properly setting the table for a fine meal is to keep your guest's convenience paramount. Think about the order in which they will use the items and make them easy to access. That way, guests can relax and focus on your delicious meal.